The Times, Independent, FT, Mail, Telegraph and Sun link the commissioning of the Migration Advisory Committee (MAC) to the publication of the exit checks programme and the Office for National Statistics (ONS) figures on net migration today. The papers report that the Home Secretary has asked the MAC to look into the impact of international students in the UK. The Times say will look at a number of areas including their contribution in tuition fees and to the UK economy. The committee is expected to report its findings in September next year. The Home Office report on statistics being collected under the exit checks programme has also received coverage in the papers. The report provides data collected on travellers departing from the UK and can be found here. The papers also note the latest set of net migration statistics, published by the ONS today, which relate to the year ending March 2017. The Immigration Minister has responded to these figures. The majority of the papers, including the Telegraph, Guardian and FT follow up on yesterday's story that the Home Office sent over a hundred letters to EU citizens telling them that they faced detention and removal from the UK. The papers reference the individual case of Eva Holmberg, a Finnish national who received one of these letters. 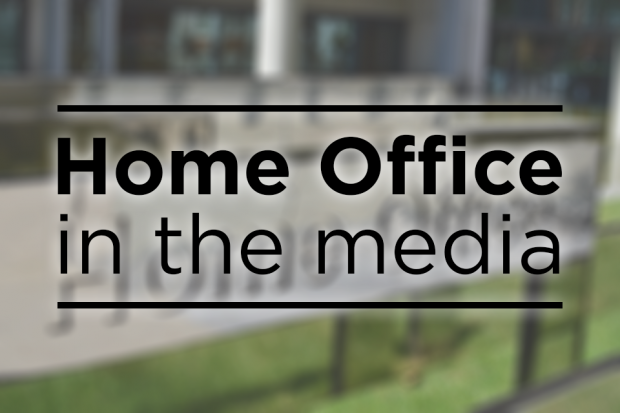 The Home Office statement has been carried, highlighting it was an error and that we are contacting all of the individuals to tell them to disregard the letters. The Mail and Sky News report that the photos of 20 million British people are being held on the Police National Database, which the Biometrics Commissioner, Professor Paul Wiles, has warned will risk "undermining" public confidence in policing by consent. The pieces reference that Professor Wiles has urged the government to publish the Biometrics strategy and to clarify whether it intends to create a legislative framework for the use of facial images. The Home Office can clarify that it is 20 million images on the Police National Database. These are not images of 20 million different people as some people arrested will have had their photo taken multiple times. The Biometric Strategy will be published in due course and the review of the use and retention of custody images can be found here. Facial searching plays an important role in the detection and prevention of crime. There is a clear need to strike a balance between protecting an individual's privacy and giving the police the tools they need to keep us safe. For this reason we published the Custody Image Review in February 2017 under which people not convicted of an offence have the right to request that a custody image is deleted from all police databases, with a general presumption that it must be removed, unless there is an exceptional reason for it to be retained. The retention of facial images by the police is governed by the Authorised Professional Practice published by the College of Policing.